We hit the road with Spain, Germany and Italy in our sights. The plan: experiencing some of Europe’s incredible nightlife and shopping. They say New York is the city that never sleeps, but Madrid is certainly burning the candle at both ends too. Madrid nightlife is all about moving from terraza to terraza as darkness falls. Strips of pavement are crowded with partygoers who eat as much as they drink. Tapas are always a favorite for Spaniards and we were definitely as enthusiastic as they were. We did a tapas crawl, soaking up the culture of the warm night. Afterwards, we headed to Chueca, known for its gay nightlife. Munich is a city of beautiful architecture and rich history, but it’s also known for its incredible nightlife. Like Spain, people don’t really head out until 11 or 12 at night. The beer gardens are a great starting point as the sun is setting. Friends recommended Hanoi Bar and Candy Club – both were lively and crowded and we had a great time. Everything in Munich is really accessible through public transport. During the day, we wanted to relax, but also wanted to make sure we toured Munich’s impressive architecture, including The New Town Hall. But a few of our friends really wanted to go shopping and we had heard that at Ingolstadt Village you could customize your own denim, and we loved the sound of that. That, together with cool brands such as Philipp Plein and MCM, made it worth the trip. Like the other Villages, the brands have up to 60% off retail prices, but we did so much shopping, we were worried we would have to ship some bags home separately! Flying into Milan was exciting – it is, after all, one of the fashion capitals of the world! We were all looking forward to experiencing la dolce vita. The nightlife in Milan is varied, with everything from lounges to clubs; a lot of gay bars are on Via Sammartini. One of the best bars we visited was Café Atlantique – full of stylish people in an equally stylish atmosphere. For shopping, we headed to Fidenza Village, which is just down the road and had some great offers on Levi’s. We were also excited about finding top-name brands such as Guess and Italian fashion royalty Missoni. 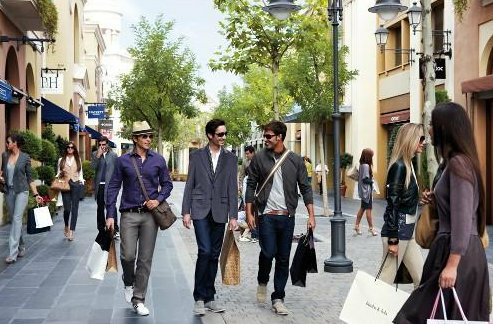 Chic Outlet Shopping® is a Platinum Partner of IGLTA.